ГлавнаяМорское ЧтивоShip NavigationVarious Aspects of Ship HandlingWhat is Mediterranean Mooring of Ships? What happens when there is not enough space at the wharf for a number of ships or boats to be moored? Or what happens when there is a ramp at the stern of the ship (like a car carrier) that connects it to the hold? The answer is that the ship has to be moored perpendicular to the wharf with its stern transom (surface) lying parallel to the jetty. Such “end on” to the quay berthing is called “Mediterranean Mooring”. Mediterranean mooring, also known as “med mooring”, is a technique for mooring a vessel to pier at a perpendicular angle. The ship thus occupies less space as it is connected to a fixed length of pier along the width rather than its length. The disadvantage of Mediterranean mooring is that it is more likely to result in collisions and that it is not practical in deep water or in regions with large tides. Mediterranean mooring can be done in two ways. Now the boats or crafts like yacht can be berthed bow to or stern to with the wharf depending upon the convenience or preference of the crew but in both cases an anchor is dropped from the opposite end of the one that is approaching the jetty in such a way so that that the end remains fixed and the anchor can be hove up and hauled out. At first the place where the ship’s stern is to be brought alongside is located. A firsthand knowledge of the shore line is required, like if there is a protrusion or not at the underwater section or the bed is shallow or shoaled. In that case the stern first approach is aborted and the bow first approach is tried. For a vessel having normal right handed propeller the wharf is best kept on the port side and the distance is kept more than seven ships length. The ship is at first kept parallel to the berth and then it is brought astern. The point of berthing is now generally abeam. All through the astern movement the rudder is kept to hard over port so as to get the maximum canting effect. As the ship falls astern, the bow will naturally cant to starboard due to transverse thrust. The Starboard anchor is dropped in such a way so that the scope (it’s the ratio of the length of the anchor rode and the vertical distance from the bow of the vessel to the bottom of the water or the bed) is 7:1 (approx). So if the sea bed is 10 m down from the bow, a distance of 70 m is required. Smaller crafts with shorter anchor chain will try to make this distance as much as practicable. The chain is let to fall free so that the anchor digs at the sea bed in the first attempt. It is ensured that there is no snag in the rode (it’s the length of the anchor line or chain) and that there is enough length of the chain to reach the berth. The anchor must be dropped away from the other anchor lines or the lazy lines, which are used to retrieve heavy pre embedded bow lines substituting the anchor. Otherwise fouling of the anchor chains or these lines can be quite a cumbersome affair during sailing. Meanwhile hand fenders are arranged along the sides to protect the hull of the ship/boats on a windy day from colliding with the other crafts that are docked already. The vessel is slowly brought astern keeping in mind that the wind is not on- shore. Otherwise the fall cannot be restricted. Off shore winds are of great help as they dampen the stern board movement and the vessel will have a tendency to stop without much use of the ahead movements on the telegraph. When the wind is athwart, the first line ashore will be the one from the windward side. In this case if the wind pushes the starboard hull the starboard quarter line is to be sent ashore first. Then the other rope from the opposite end is thrown ashore and ensured that both the lines are” doubled up” i.e., the lines are made to take a turn on the shore bollard and are sent on board. This helps the crew while hauling out as only casting one end of the line from on board the line can be retrieved with the winch without any shore assistance. On a windy day the first shoreline is sent ashore by a small motorboat or a dingy so that the vessel can be warped in with the help of its winches. 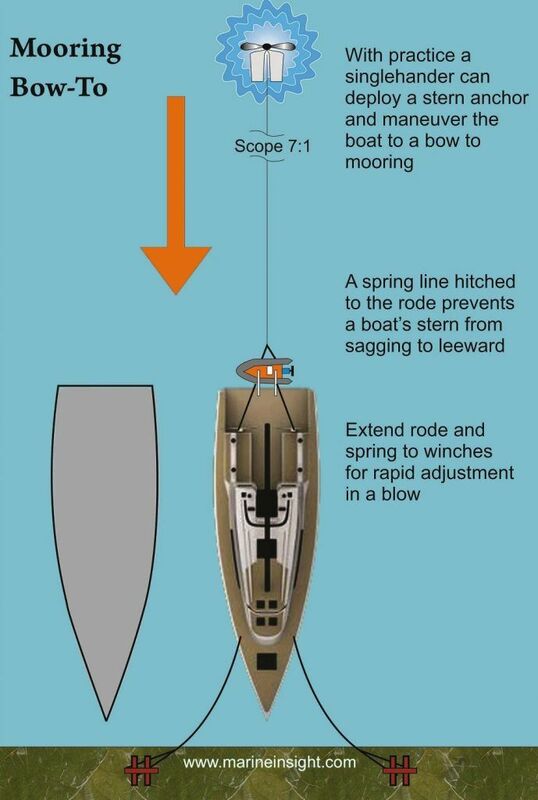 While hauling in if the bow swings corrective counter measures are taken with short kicks of forward movements and necessary helm or holding the anchor a bit, as the case may be. The lines ashore are fast in such a way that the angle between them is wide enough to restrict any swing of the stern due to any surge in the wave or wind. It is best to set another pair of lines across the stern to the shore. The boarding ramp is employed for the crew to step out from the stern. Also cars and trucks loaded in the car carriers can be loaded or unloaded. Docking “Bow to” is much easier though as the pilot or the master has much more control over his ship as he steers in letting his stern anchor far off the berth so as it holds the stern during the stay. A line from each quarter is hitched to the chain aft to restrict any side wards play. Two lines are passed ashore from the port and starboard bow at a wide angle as in the previous case so as to make fast the bow to the jetty. This type of bow fast approach is done if there is an underwater shoal below the jetty or there is a protrusion. In both cases the anchor is snubbed when there is only a boat length difference between the quay and the bow or stern. Engines are also given accordingly so as to avoid any untoward collision.